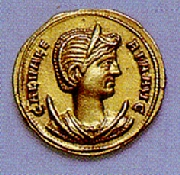 The daughter of Diocletian, Galeria Valeria was married to Galerius at the time of his elevation to the rank of Caesar in 293 AD. It is not entirely certain when she was first accorded the title of Augusta, but it was confirmed at the Carnuntum Conference in November of 308 AD. 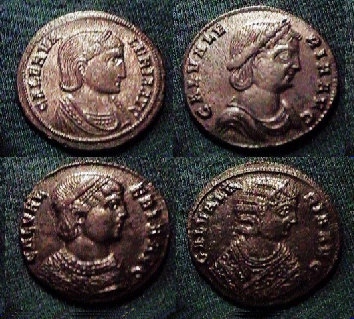 Galerius, her husband, was a cruel and ruthless leader who did much to persecute the Christians. However, Galerius was stricken with a terrible cancer that ate through his body slowly. Believing this horrifying illness was the wrath of God, Galerius repented days before his death ending the persecutions and promoting the building of churches. In the aftermath of her husband’s death in 311 AD, Galeria was treated harshly by both Licinius and Maximinus and eventually executed in 315 AD.